Dr. Travis L. Frampton developed a growing interest in Dr. James B. Simmons's life and works several years ago upon reading The Cause and Cure of the Rebellion, an abolitionist sermon published by Dr. Simmons in 1861. The following story details Dr. Frampton’s journey on his sabbatical to learn more about the life and legacy of the institution’s founder. changed for the better by Dr. James B. Simmons’ story, I wanted to know more about our university’s founder, especially his early life. Who was he? From where did he come? What was his family like? In the summer of 2014, I headed to the Northeast for my sabbatical. I visited the places he lived, the churches he pastored, and schools he attended. Why? Because I believed that in his story, our university would find an answer to the question: Why Hardin-Simmons? I learned that our identity rests in his story and therein is our reason for being. In addition, I learned to be a better Christian, to have greater thoughts and to carry them dutifully to completion and in the end, to direct my own life’s work toward making the world a better place. I also learned we must tell his story. during the progress of a trial, a fugitive slave broke away from the marshal and began to run away. In 1858, just three years before the Civil War commenced, Simmons was threatened with a “coat of tar and feathers” and subsequently lost the meeting house of his church in Indianapolis, which burned to the ground in 1861, because of what he was preaching from behind his Baptist pulpit. In the postwar era, he helped establish across the Southeastern United States 10 colleges, most of which were for freed slaves. He believed in educating all people. He was a close friend and associate of John D. Rockefeller and Booker T. Washington. His circle of friends included the Beecher family (especially the brother of Harriet Beecher Stowe, author of Uncle Tom’s Cabin). Needless to say, Simmons was highly respected and well connected, corresponding frequently with several prominent American icons of the late nineteenth and early twentieth centuries. 1. What is the greatest thought that has ever occupied your mind? 2. What is your duty toward fulfilling it? Although we are known as Hardin-Simmons by name, we must be Christlieb in spirit, with greatest thoughts and a duty toward fulfilling them. We must be good stewards of Simmons’ vision for our school and, as such, work to inspire others to action—as students, alumni, faculty, staff, administrators, and trustees—to realize and participate in the worthy cause he set into motion 125 years ago: the College of Christ’s Love. The story of James B. Simmons brings gravitas to the work we do. 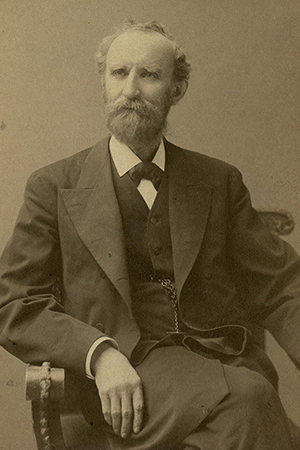 The $5,000 he donated in 1891 may have aided the completion of Old Main, but the rich legacy he left continues to this day to encourage people to make a difference in the world. It would be difficult to name an individual who had more influence in the 19th Century on higher education for the betterment of all people than Dr. James B. Simmons. It would be difficult to name another more influential, whose impact reached from the East Coast to the Western Frontier of the United States, helping establish 10 colleges in all—six of which still remain. James B. Simmons’ story is our university’s story. It is the Hardin-Simmons University story par excellence. It is a Gospel about doing—a Gospel of not just knowing Christ, but being Christ to the world. The reason Simmons’ story is so compelling is because it exemplifies the Christian narrative by incarnating the gospel. What did Simmons have to gain as pastor of the First Baptist Church of Indianapolis when he spoke out with such vehemence and resolve against slavery? More importantly, consider what he could have lost? Since the day he was buried beside his wife, just south of Old Main, in what was then a cow pasture, we have had the answer to what makes us different from more than five hundred Christian liberal arts colleges across the country. Simmons provided us with an inspiring example of the ways in which Christian education could change the direction of a nation by reconfiguring its moral compass. Dr. Travis L. Frampton serves as Professor of Biblical Studies at Logsdon School of Theology at Hardin-Simmons University.